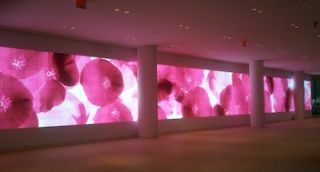 IAC and Prysm, Inc. have unveiled two new video walls in the lobby of the IAC headquarters, located in the Chelsea neighborhood of New York City. The Frank Gehry-designed IAC HQ is home to many of IAC’s Internet and media companies. The new installation features a super high-resolution video wall using Prysm’s Laser Phosphor Display (LPD), a display technology delivering life-size images using low-power, solid–state lasers. The two walls will deliver more than 50 million pixels combined, and will reduce power and cooling costs by 70 percent over the previous projection technology. Prysm’s new LPD technology gives designers the freedom to create video content in any shape, size or format. IAC HQ’s video displays consist of two separate walls. The west wall measures nearly 120-feet wide by 10-feet tall, consisting of over 43 million pixels, and the east wall measures 20-feet wide by 10-feet tall, displaying 7.3 million pixels. The two walls deliver close to 180-degree field of views, leading to immersive views from any angle in the large event space.